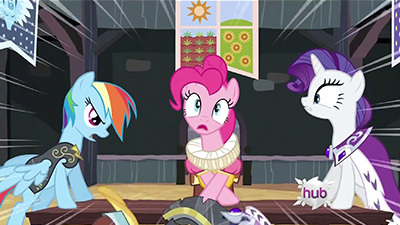 This episode takes an interesting spin on worldbuilding: rather than trying to drop subtle hints here and there throughout the story or smack the viewer upside the head with an exposition bat, it has the Mane Six acting out the lore of the founding of Equestria in Canterlot’s annual Hearth’s Warming Eve Pageant. The play describes how the three pony tribes (earth pony, pegasus, and unicorn) coexisted in the days prior to what is now known as Equestria: pegasi managed the weather, unicorns raised and lowered the sun and moon, and earth ponies used the weather and day-night cycles to grow food to feed all three tribes. In theory this setup should have worked just fine, but growing animosity among the tribes bred distrust and eventually outright hatred toward one another. Thus when a terrible blizzard struck the land and made food incredibly scarce, the tribes blamed each other for the famine rather than work together to try and develop a solution. After all three tribes lost the Blame Game™, they finally decided to give diplomacy a shot to see if some kind of agreement could be reached. Of course, that went swimmingly. Taking matters into their own hooves, the leaders of each tribe set off to find a new land to claim as their own and upon whose soil they would rebuild their respective societies. Several cloud-fights, holy maps, and raging rapids later, the three tribes discovered precisely the lands (or skies, in the pegasus case) they were searching for… only to find that they had all found the same land! The ensuing argument was interrupted by another blizzard which drove them all into a nearby cave, which itself suddenly became the most ridiculous land-grab for sovereign territory the world had likely ever seen. But even though the fighting was heated, it wasn’t nearly heated enough to keep the blizzard at bay: the cold crept into the cave, encasing the still-fuming tribe leaders in ice and leaving their humble assistants mere moments to express their own views on the matter. During that time, they made two revelations: first, that the blizzard was being caused by windigoes, magical beasts who turned hatred and fighting into powerful storms, and second, that they actually didn’t hate each other because at the end of the day they were all ponies. That little glimmer of hope was enough to ignite the Fire of Friendship that burned within their heats, the warmth of which drove back the windigoes and eventually melted the hearts (and icy prisons) of their leaders. I for one very much enjoyed the story-within-a-story in this episode. Getting some backstory on Equestria, the different pony tribes, and generally how wonky pony culture could be at times was a great change of pace from recent episodes; you might say it was a very heartwarming tale (pun absolutely intended; efficacy unclear). While I wouldn’t necessarily want to learn more about Equestria in this particular pageant format, I do love me some worldbuilding. That said, there’s something about the way Merriwether Williams, this episode’s writer, portrays the Mane Six that makes them seem… off. We’ve seen it in The Mysterious Mare Do Well, we will see it in the future, and we see it here. However, since much of this episode centers around the Mane Six acting the parts of over-the-top diplomats and their overly-cautious assistants, this actually makes their off-ness less jarring and, one might argue, even enjoyable. Commander Hurricane’s hot-headedness, Princess Platinum’s prissiness, Chancellor Puddinghead’s randomness, Private Pansy’s timidness, Clover the Clever’s smarts, and Smart Cookie’s sensibility are all reflections of their players’ characteristics cranked up to eleven (well, maybe just 10.5), but because it’s not the Mane Six themselves being so exaggerated, it’s much more tolerable and fun. Unfortunately, outside of the pageant, the Mane Six are so dopey and childlike it hurts; fortunately, their non-pageant screen time is pretty short so the pain is brief. At the risk of sounding dopey and childlike myself, I put the quote at the top of this page there because I think it’s such a good lesson for our own lives as well. It’s frustrating and very sad on many levels to see people fighting over completely irrelevant things like who owns a rock (obviously a metaphor for [insert XYZ material object of immense perceived but little true value here]). I’ll admit that sunshine and rainbows can’t solve all our problems, but a good chunk of them probably could be if we would just shut up and realize how silly we look and how counterproductive we are when we work against each other rather than with each other. Those frivolous arguments consume all the time and energy we could have been pouring into solving that remaining chunk of our problems that are actually important. Anyway, kind of an irksome episode… but a wonderful episode-within-an-episode. Finally, Wild Storm is a very well-made and very dramatic story directly inspired by this episode that will take your breath away (pun intended… you’ll have to read to find out). I try not to post things that contain major spoilers, but this is just too good to omit so… major spoiler warning! Also, it may help to read the previous meta-story to understand what’s going on, which kind of necessitates reading the meta-story before that, which contains yet more spoilers. So yeah, if you haven’t yet watched the series, best to steer clear for now. If you have, though, I’d highly recommend checking this one out! I love worldbuilding. History and geography and culture and all that. The trade between the different Pony groups based on what each can supply, the conflict that rises from the imbalance in power. I’m a huge fan of creating worlds as broad and varied and detailed as possible. That said? I wind up having many many more questions than answers. What happened to the Ponies initial homeland? Is it still ruled by Windigoes? Did they ever go back to get their stuff and bring it to the new place? Growing food seems to be the exclusive domain of the Earth Ponies. Compared to flight and magic, it seems like a relatively poor ability… until you’re hungry. This story is older than Celestia. That makes it at least a thousand years old, more likely a couple thousand. Clover the Clever was the apprentice of Star Swirl the Bearded. Which might actually make him older than Princess Celestia. That’s a really weird thought, given her divine status in the series. The various tribes call their new land Pegasopolis, Unicornia, and… Earth. This may be the most Pinkie Pie episode since the last one. Where’s Discord? Equestria was his until Princesses Celestia and Luna used the Elements of Harmony to seal him away. Did he arrive after the Ponies, or was he just elsewhere on the day they showed up? Maybe he had more important chaos-y things to do. The cycle of conflict and friendship shows up time and again throughout Pony history. The Breaking of the Ponyship and the Fire of Friendship, Discord and the Elements of Harmony, Nightmare Moon and the Thousand Year prison. All of this has happened before, all of this will happen again. Time is a flat circle. Ponies. Ponies never change. All told, it’s a good source of drama and conflict and character development and growth. However good things may be, there are always always always differences between people, and that potential for disagreement always exists. This episode is an excellent framework for the history of the founding of Equestria, and I sincerely hope it’s built on in future episodes. This episode is technically a holiday special, although really it’s more a pony history lesson disguised as a holiday-themed episode. Except it may not even really be that, but more on that in a bit. 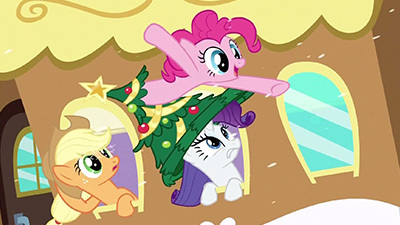 It’s definitely not a Christmas special (although what little we see of Hearth’s Warming Eve in the scenes that aren’t taking part in the play is definitely very Christmas flavored), with the holiday in question falling more into the category of “generic winter celebration”. Which is good, because, well, not everyone celebrates Christmas. The very beginning of the episode gives us our first glimpse at the Friendship Express, which… sorta clashes a bit with how we saw trains working in previous episodes, but well, there were toys to sell… We never do get a proper explanation for the difference in train mechanics (the pony-pulled trains aren’t ever a thing again in the series), but an easy enough explanation might be that the engine was broken before. This isn’t the first time the show’s placed something into an episode to correlate with merchandise, but it is the first time it’s nudged the continuity a bit. This is another Merriwether Williams episode, and my typical complaints still apply, although like Gerf said above, it’s tempered in a major way by the fact that the Mane 6 are playing parts and aren’t actually supposed to be in character as themselves. Granted, the parts they are playing are wildly exaggerated versions of themselves, but it makes it much easier to swallow the characters sniping at each other throughout the entire thing, and I kind of love the pageant characters as we’re at least led to believe that they may have really been at least a little like we’re shown. I agree with Gerf that the non-pageant parts of the episode are a little bit rough, but the play itself is actually really fun, and entirely the reason why I like this episode. I’ve seen people pick apart the story being told in the pageant and calling plotholes in the tale before, which always seemed odd to me because… well, it’s a pageant. By their very nature they present a massively stylized and abbreviated version of events that are based on what really happened but likely take a few liberties in the interest of making a compact story with as few roles as possible. Since I tend to over-analyze to a ridiculous degree, I tend to view the play not through the lens of being told an actual accurate tale of what happened, but rather getting the opportunity to look at some of the details and extrapolating out what was likely true beyond the straight up plot of the play. 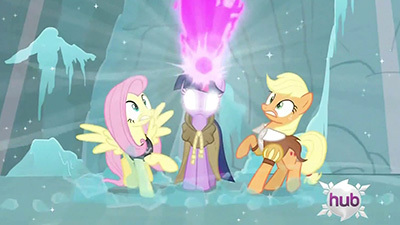 For one, the leaders and the assistants that the Mane Six are portraying did actually exist within canon (which wasn’t super clear originally, there was a case to be made that they were compiled characters to represent the nations overall for the sake of the play), since the book The Journal Of The Two Sisters (which is a shared diary of Celestia and Luna from the early years of their rule) calls them all out by name as the former rulers of their respective nations. They don’t get any dialogue in the book due to the nature of it, but they seem to have more or less the personalities shown in the episode. The book also confirms the two sisters not being around for the founding of Canterlot, being given rule of it later to settle the dispute of who would actually lead the united pony nation (likely either the Equestrian flag was made after Celestia and Luna took over or there was a prior design to their rule that this episode doesn’t show). Beyond that, it’s super interesting getting to see the citizens of the former nations and what it potentially says about each one. The earth ponies having a slightly more bedraggled and peasant-like look to them isn’t particularly surprising, but what is surprising is that at least some of the unicorns have the same look, which suggests that despite the emphasis on nobility that unicorns have seemed to have, there was a definite class system at work within their society, and not all of unicorn-dom was particularly well off (which does fit Princess Platinum’s general attitude along with her treatment of Clover). The pegasi, on the other hand, are completely lacking in any bedraggled-looking citizens, instead all looking equally clean and well-dressed. This seems to suggest that the pegasus nation may have been the most prosperous overall, and combined with the fact that its leadership is military-based and the fact that Commander Hurricane is very willing to turn to conquest to solve her problems might mean that at least some of that prosperity was gained by force (out of the three the pegasi as presented appear to be the most likely to be the conquerors, and being able to control the weather makes for a fairly threatening weapon when used in the wrong hooves). Past that, the unicorns appear to be second in prosperity (although likely said prosperity was concentrated in the royal class), and the earth ponies oddly enough appear to be at the low end despite having access to the resource that seems to be in very high demand (granted, they appear to be trading said resource for services on either end rather than getting any material goods in exchange). Of course, the other explanation might be that the classes are significantly closer together in earth pony society, and Chancellor Puddinghead’s relatively humble residence (compared to the other two leaders) isn’t indicative of the overall level of wealth within the nation. Continuing through the play, obviously the three nations setting out to find new land has to hold true, although it’s very possible (and probable) that it wasn’t just the nation’s leader (or in the case of the unicorn’s, the daughter of the nation’s leader) and an assistant setting out, but more likely a larger group of settlers with the leaders possibly in tow. If we start to run with the idea that the play is being a bit allegorical, then we can start to do some really interesting fanon theorizing about what really happened leading up to Equestria’s founding. Is the bickering and tussling between the leaders in the cave representative of more substantial conflict between the newly re-founded nations? Were the Windigos an actual presence, or are they metaphors for something a bit more dark that might have happened? Granted, we’ll likely never hear a real answer to any of this, but it’s fun to think about. Oh right, and there’s also a song in this episode that nobody really cares about and tends to be outright forgotten in song lists because it’s kind of super generic. Mixed on this episode. I don’t dislike any of it, but there are parts that just flew over my head and I kinda drifted off from. Tessa, I’ll admit to going all googly-eyed at your analysis, too, though I would like to see that expanded into a Prime Time mini-series event examining what “really” happened! I didn’t mind the attitudes or the sniping, finding them appropriate to the story, especially with that stinger at the end, and it was fun just having a standalone backstory episode told in this format. Reminded me a bit of the Animaniacs movie Wakko’s Wish, where it was an epic period story starring the cast, who are both playing themselves and the characters in the story. It’s a fun format to play with. And there is some nice satire in here. The rock scene is magnificent. The closest we’ve gotten so far to getting to look back on a more “accurate” course of past events is the book I mentioned in my bit, but that takes place after the events of the pageant and while it features the former leaders we don’t really get much of anything substantial about them as the book is much more focused on young Celestia and Luna. It’s definitely not impossible that we’ll get another look back at pre-Equestria history at some point, but I’m not really expecting that to happen, and after how bungled getting to look back into Nightmare Moon backstory wound up being (way down the road from here, but I’ve alluded to it being a thing before) I’m not sure I really want it at this point. Leaving it vague and up in the air what things were really like gives a lot of freedom for fanon to come in and fill the potential blanks, and it’s doubtful that getting a for-realsies canon version would live up to whatever fanfic-fodder we can come up with.